The commercial success of Star Wars has given George Lucas the opportunity to alter his original trilogy, which is composed of Star Wars Episode IV: A New Hope, Star Wars Episode V: The Empire Strikes Back, and Star Wars Episode VI: Return of the Jedi. Many changes were motivated by George Lucas's desire to make the original films closer to his original vision for them. 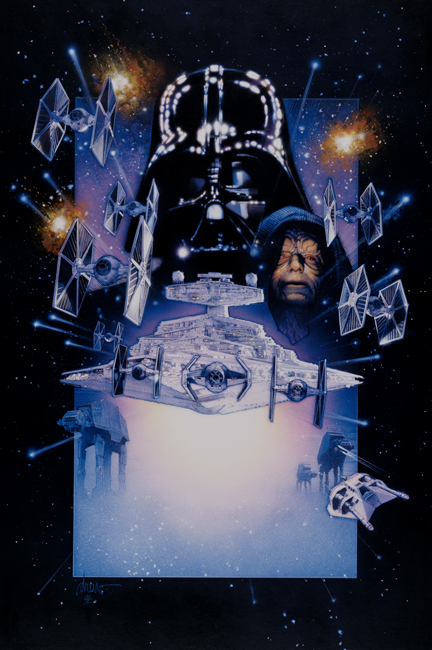 These three posters immediatley became the favorites of George Lucas. Each of the three signed and dated "drew '96 & '97"